Blue Suede Shoes Bicycle - Misc. New from EPE is an Elvis bicycle! You can buy a blue or red one for almost 180 dollar. The theme from the red bicycle is "Love Me Tender". Pre-order only. 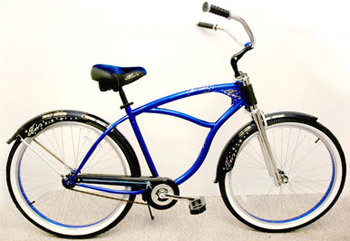 Take a stroll down the street with Elvis on this "Blue Suede Shoes” bicycle. Features 26" classic mens cantilever cruiser frame, durable steel construction soft dual elastomer suspension, comfortable seat, foot operated rear coaster brake for sure stopping, chrome plated dual crown fork, wrap around fenders, classy twisted spokes, and comfortable riding whitewall tires. A bike for the kids? Is there anything that EPE will NOT merchandise? With the kids taken care of - what's next? An Elvis themed wheelchair and/or walker for the older fans? EPE sure endorses Elvis with a bunch of junk. It was a wise decision to sell the rights so that EPE could embarrass themselves with all the "high quality" merchandising -- nice going Lisa Marie. Thrilling!! And you know what?? The air in the tires is smuggled directly out of the Jungle Room during one of Elvis' sessions in 76'. whats next from this group - Elvis toilet paper? Hey it might make some new young fans!! LOL Give me the red one any time ! I would really love one of these, but I'm too old to ride one. Perhaps a walking frame with wheels would be good!